If you were to ask me who my three favorite Batman artists were, you could make a decent guess at my age. Or at least, when I was really reading comic books. Those three artists would be Jim Aparo, Norm Breyfogle, and Mike Parobeck. Of the three, Aparo had the longest career on the Caped Crusader. He went from The Brave and the Bold in the 70s to Batman and the Outsiders in the 80s to Batman and Detective Comics in the 90s. Breyfogle started with Detective Comics around 1987 or 1988 with Alan Grant, and, as a team, they moved on to Batman and Shadow of the Bat in the 90s. 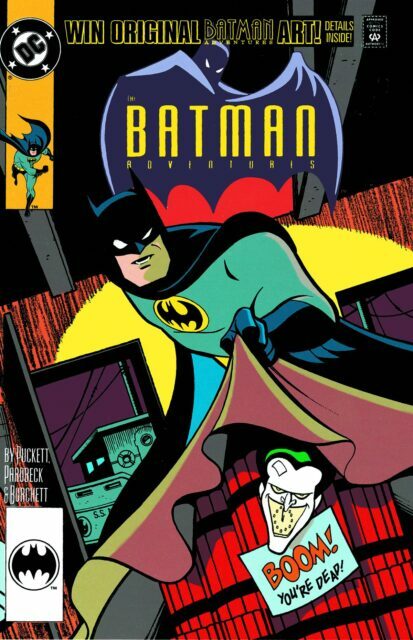 Parobeck had the shortest tenure (for tragic reasons) of the three artists; his Batman tenure was thirty-odd issues of Batman Adventures, a comic based on Batman: The Animated Series, in the early 1990s. In an era where the main Batman comics saw Batman’s back broken and the rise of a psychopathic Batman in the form of Jean-Paul Valley, Batman Adventures was a breath of fresh air. Kelley Puckett’s storytelling was fairly straightforward — and occasionally a little more violent than FOX allowed on Batman: The Animated Series. Each issue was a one-and-done, each story was broken up into three distinct chapters. People are threatened, Batman (or one of his allies) investigates and takes action, there’s an action-packed climax, and, usually, a final punchline or coda to make you think. If you want to study the nuts-and-bolts of comic book storytelling, Batman Adventures would be a good place to start. I didn’t read Batman Adventures for Puckett’s writing, though. I read it for Parobeck’s artwork. Parobeck took over the book with issue #7 and, for a book based on a television series with a distinctive visual style, he made it his own. When I think of Batman: The Animated Series, I’m as likely to think of the way Parobeck interpreted the series in the comics as I am of the way Bruce Timm and his artists produced the series for FOX. I discovered Parobeck with a 1991 Justice Society of America mini-series (set in the 1950s), then I followed him to The Fly (DC’s updating of an Archie Comics super-hero), and after that came another Justice Society series (this one set in the 1990s). There aren’t words to express how much fun Justice Society was. Yes, it was a book about a bunch of senior citizen super-heroes, but it was gorgeous and it was dynamic. Looking at the way Parobeck drew Jay Garrick or Alan Scott was joyful. It’s a criminal shame that this Justice Society work hasn’t been collected. Criminal shame! The point is, when Parobeck took over the art chores on Batman Adventures from Ty Templeton, a book I was only aware of suddenly became a must-buy. DC has started collecting Batman Adventures, and last week they released volume 2, collecting issues 11 through 20. I read it this weekend, and I didn’t even read it in order. It’s the nature of the stories; as one-and-dones, the stories are self-contained and there’s no continuity between the issues. I read the Batgirl issues first, followed by the Talia issue, then the Man-Bat issue, etc. Essentially, I went through the book at random, reading what interested me. The stories were more interesting than I expected, perhaps because I was better aware of the structural needs of storytelling now than I was back then. And Parobeck’s artwork was better than I remembered. I can see Bruce Timm’s vision in Parobeck’s artwork, but I also see Parobeck’s distinctive style. He suggests the world of the Batman: The Animated Series, and then he does his own thing. And it’s glorious. As for the stories, my favorite in the volume was the Talia story. Batman and Talia find that they’re after the same people, so they team up on an international quest that takes them to Paris. The middle part of the story is a charming sequence in which Batman and Talia have a Parisian romance, which makes the coda of the story — and Talia’s final line — utterly heartbreaking. It’s a narratively strong story, and Parobeck conveys a lot of emotion with his artwork. The Man-Bat story, which kicks off the issue, is powerful, though I saw where it was going very early on. The Batgirl stories were fun. One is Barbara Gordon’s first outing as Batgirl — and she comes up against Poison Ivy and Harley Quinn quite unexpectedly. The other is the first meeting of Batgirl and Robin, and they work together on a case. There’s an interesting Ra’s al-Ghul story. I wasn’t quite sure where it was going, and it genuinely surprised me in places. The final story in the book features a trio of villains created for the Batman Adventures comic — Mastermind, the Professor, and Mr. Nice. Mastermind (who looks like former DC editor Mike Carlin) is a genius; he’s so smart and can see so many moves ahead that he can probably beat Spock at eleven dimensional chess. The Professor (who looks like former DC editor Denny O’Neil) doesn’t seem to have any useful skill, though he likes to chronicle their adventures. And Mr. Nice (who looks like the late DC editor Archie Goodwin) is the group’s strongman — but his downfall is that he’s a terribly nice person and can’t really be bad. It’s a genuinely funny story, and I liked it. There’s some fun storytelling in Batman Adventures Volume 2. What really makes it worth having, in my opinion, is Mike Parobeck’s artwork. If you love Batman: The Animated Series, prepare to fall in love all over again when you experience it through Parobeck’s pencils. It’s wonderful stuff.